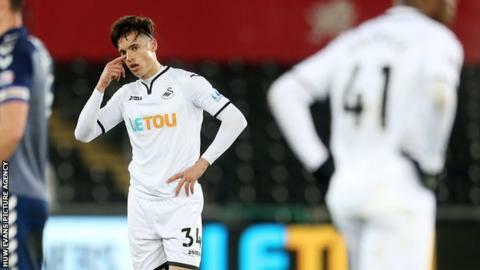 Swansea City youngster Jack Evans is in remission after being diagnosed with cancer last summer and has signed a new contract at the Liberty Stadium. Wales Under-21 international Evans, 20, has not played for Swansea's development squad this season as a result of cancer treatment. His previous deal was due to expire in June but he is now contracted to 2020. "I'd like to thank the club for extending my contract and for their support during my treatment," he said. "I would also like to thank all the nurses and staff at the Teenage Cancer Trust's unit in the University Hospital of Wales in Cardiff for their tremendous effort, care and support." Local lad Evans joined Swansea's youth set-up when he was just eight years old. The central midfielder made 18 appearances for the club's under-23 team in 2017-18 and captained the side during pre-season this term.